I think after my realness posting on the first trimester, I think I gave a lot of people a scare. I wanted to check in and let everyone know that this trimester has been amazing! I’ve felt so good the past couple months! Mentally and physically. The bump is definitely there! I’ve officially transitioned out of my normal pants and have been living in leggings. It is weird though, because it is still an in-between time and under clothes I think it looks like I’ve just gained a bit of weight. 🤷🏻‍♀️ I’m looking forward to it looking more official! We had our mid-pregnancy ultrasound this week. It went very well! Baby is tracking on average. We are measuring a bit ahead of schedule, but not by much. I had to go back to get another one because lil’ man wouldn’t give us the proper view of his heart. And that’s right we learned it’s a BOY! We were absolutely shocked but our hearts are bursting! We really, truly believed it was a girl! But now fully readjusted and excited about all things little boy! We should’ve known that it was a boy because last weekend the baby was kicking me like crazy with Conor screaming in the last minute of the IU v Michigan State basketball game. A lil Hoosier fan in the making! I finally started the process of registering for baby things. I spent 12 hours last weekend researching strollers. YEP. My mind is exploding about the strollers. I also realized that the cribs I like are almost impossible to find in the US. Classic me. I think I’m finally beginning to understand baby gear, which is huge up-leveling for me– and maybe overcoming a huge fear too?! Just another reason for me to get back to my Marie Kondo-ing of our condo! Lastly, beginning to understand this whole Mom tribe thing–I don’t know where I would be without all of my wonderful friends giving me advice! I’ve been able to get back to my normal eating habits. Lots of eggs, sweet potatoes, greens, avocados, and all of the cucumbers (etc. etc. etc.). So my body is nourished, and has been full of energy! I’ve gotten back to yoga and even have worked in some cardio (more exercise thoughts below). Still eating a lot of citrus–I’m blood orange and clementine obsessed. I am loving cucumbers (see photos!). I’ve continued to eat cereal and toaster waffles. I am definitely eating more sugar and carbs than my normal diet, but not too much. The actual cravings have not been extreme. Not much, but still very weird around chicken. I still eat it occasionally as long as its overly seasoned. The biggest is nasal congestion. I wake up almost unable to breathe every day. Which is wild because thankfully, I haven’t been sick since the first week in January. This happened when I was in Florida too! Apparently it’s common but I hadn’t heard of it before this. Acid reflux has kicked in a bit, unfortunately. I need to keep my meals small and more frequent rather than larger and less often. I also have some low back pain. Nothing too troubling yet. Looking into pregnancy pillows to help solve this. Prenatal was my favorite part of yoga teacher training. Maybe it was a bit of foreshadowing? I’ve been trying to work in movement 4x/week but it’s been slow getting back to my normal routine. I have gotten back to spin class, cardio has felt great! The one downside is that sitting on a bike, I feel like I have to pee the whole time. Yoga continues to be awesome. I’ve added in a couple different prenatal classes into my routine and feel incredible afterwards. That being said, I still need a bit of a push to keep my strength up so I also still go to my favorite regular level 2 yoga class, but have to make some modifications. Avoid hot yoga. Moderately heated (like 80-85 degrees) is fine, but skip the Bikram (105!). Avoid intense twists. You can do some gentle twisting if it feels okay to you. Some people are fine with extreme back-bending like urdva dhanurasana (wheel pose). I attempted it a couple times because it has always been apart of my practice, but it never felt right. So I finally adjusted to a supported bridge position. It also can cause diastasis recti (where your abs separate)- and no one wants that! When going from a position where your head is below your heart, take your time coming back up to standing. Pregnancy can cause haywire on your blood pressure, so you want to give your body time to adjust. Your center of gravity has shifted, know that balance poses will feel different. And be careful not to fall! Lastly, you are carrying extra weight that wasn’t there before. Your practice won’t look the same, and that’s a good thing! Don’t try to keep up or overdo it. Listen to your body, and rock child’s pose if that’s what you need! A lovely sparkling water, with a dash of cucumber shrub and splash of simple syrup. I always thought that when I became pregnant, I was going to hate not drinking. I don’t think I drink very much compared to the general population, but I enjoy the social component that accompanies drinking and I love an occasional glass (or 2) of red to unwind during the week. Spoiler: it hasn’t been that hard! 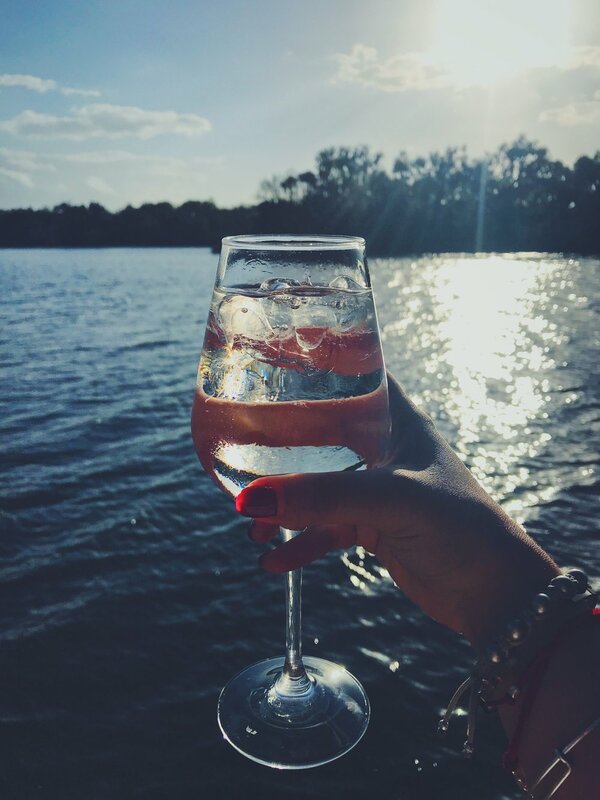 If you are considering skipping booze before the wedding this post is for you! The second month of the Shed program is booze-free. While it is not required for longer than a month, I highly recommend skipping booze for the few months before your wedding. It will really bring out that bridal glow! Below, I’m sharing my experience and tips on skipping booze from over the past few months! In general I wake up with more energy. I can only imagine how wonderful I would feel if I wasn’t pregnant (AKA not waking up in the middle of the night to pee every night and the general exhaustion that goes along with it!). In all honesty, I think that most of the benefits of not drinking are somewhat compromised by pregnancy symptoms (for me at least)– so non-prego brides-to-be take advantage of this time! More on this in section 3! I always carry a drink- preferably similar to what I typically drink. Like a soda water with a splash of cranberry (all I’m missing is the vodka!). Before I was showing, people had no idea, and I even felt like I was drinking with them. My mom was laughing at me on the dance floor at a wedding, still holding my drink. Holding a drink, alcohol or not, is a part of my party persona and it really makes me feel like my normal self. Pro tip: ask the bartender to use the same glass that they are serving alcoholic drinks in especially if you are not public with you news yet! It can be a dead giveaway (I’ve busted several friends this way!). The above works until the witching hour- which is now what I refer to the period of time when everyone’s eyes begin to glaze over and don’t make sense anymore. That is now the time I know its time to GTFO. It’s no longer fun when your people don’t make sense. I find that leaving around 12:30 on average is probably the best call. I also have been able to chill at crazy bars and have an amazing time, but at the end of the day it comes down to the company! I don’t need to be drinking to enjoy hanging with my friends! It is really nice to find any beverage besides water to drink - it can be really boring drinking water all day every day (including sparkling!). Go for soda water with a splash of juice of your choice. You can always add a dash of cucumber shrub (vinegar based flavor) or a tiny bit of bitters to change things up. But it’s really easy to overdo it! Gotta keep it in very small amounts! If you want an extra caffeine boost- unsweetened iced tea is great and looks like it could be boozy. You can enjoy kombucha just make sure the sugar content isn’t higher than 4g. If you are shedding for the preg, all of the above works but be mindful, kombucha can have trace amounts of alcohol, so be mindful about your consumption. Feel free to enjoy those mocktails, but treat them as a dessert and enjoy them on occasion. Just don’t make them habitual. Oddly, I haven’t stopped getting hangovers! What?! How is that possible you say? Typically it just takes 2 (of the 4) to make it feel like a hangover. Obviously, #4 isn’t an issue for me right now, but if three happen, I’m really in trouble. So my number 1 objective is to drink enough water consistently throughout the day so I don’t need to drink a lot before bed. Number 2 objective- I now get like 9 hours of sleep- yeah I know that’s a luxurious amount. If I have less than that it’s problematic. I chalk it up to growing a human. But that being said this is why I feel like I’m hungover all the time. It’s hard to get that 9 hours. Lastly, I try not to overdo the sugar. It’s very easy to do if you are not being 100% active in keeping it down. Added sugars are in everything, and then if you are allowing for a treat most days, it can add up and really negate all of those positive benefits from skipping the booze! If you are shedding for the wedding, added sugars are out and probably won’t need quite as much sleep. So hopefully, if you drink enough water, you should feel “hangover”-free, energized, and fabulous!